One area at Parchin could have been assessed as a "probable" nuclear weapons development facility. 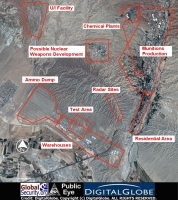 The extensive weapons development activity at the rest of the complex made it an entirely logical location for weaponization work for Iran's atomic bomb program. 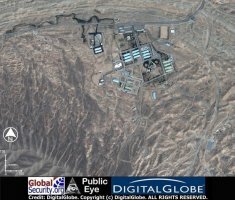 The overall Parchin complex represents the leading center of Iran's munitions industry, so a nuclear weapons program would already have all the expertise needed within commuting distance. The suspect site was physically isolated from the rest of the complex, suggesting that it was not part of the conventional ammo, poison gas or missile programs. The construction activity was also consistent with the construction activity at other parts of Iran's bomb program, and the recent completion was consistent with estimates at the time of when Iran would get the bomb. 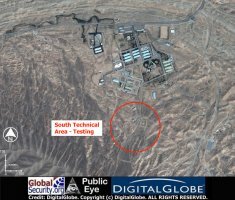 The United States was also suspicious that Iran was testing high explosives at Parchin. 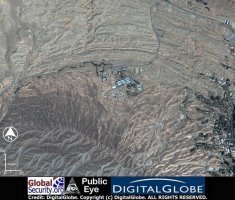 Seyed Hossein Mousavian, Iran's chief delegate to the IAEA, angrily rejected claims that satellite photos showed a military complex at Parchin, near Tehran, to be a site for the testing and production of nuclear weapons. Mr. Mosavian said there was no basis for US concern and that Iran was doing all that was asked of it by the IAEA. "First of all we completely, categorically deny any nuclear activities in Parchin. Americans, again, they are lying because the IAEA have never asked for inspections and because they have claimed we rejected the inspections of the IAEA and the IAEA up to now they have never asked for inspections." Mr. Mousavian accused the US of deliberately using misinformation to embarrass Iran at IAEA hearings. He said at an earlier IAEA meeting, the US produced satellite images for a demolished site at Lavisan, where, he said, there had never been any nuclear activity. "This is the routine behavior of the Americans in every board of governors meeting, they raise such issues, like last time they raised Lavisan, this time Parchin." "Neither the design of the facility nor the nature of the tests is unique to nuclear weapons," said Jay C. Davis, former head of the Defense Threat Reduction Agency at the US Department of Defense. "This is always a problem in trying to detect nuclear activity, and one that only on-site inspection can establish." Davis added that environmental sampling done by IAEA inspectors could detect the presence of by-products used in the testing of high explosives for a nuclear weapon. "A surrogate material, such as depleted uranium, for example, could be used in such testing and would be detectable via sampling," he said.